Subject: Painting cut glass is a challenge and this one was even more so because of the diamond pattern on the bowl. The bowl is actually the bottom of a candy dish that has a very nice top. Still working on loosening up but not having great success. Maybe I should drink more wine! Or Bloody Marys with Ketel One vodka. Side note: I heard about Kettle One vodka after reading several books by Marcia Clark--yes, the one and only Marcia Clark from the OJ trial. Rachel Knight, the main character in her series is a DA who always unwinds after work with this, so I had to buy some and see why. It's good stuff. In fact, so good, I'm sure drinking more than one would definitely turn me into an abstract artist--and not a good one--though to me the words "good" and "abstract art" should not be used in the same sentence. Please don't write negative comments if you love abstract art. My relatives and friends who love it will take care of this for you. 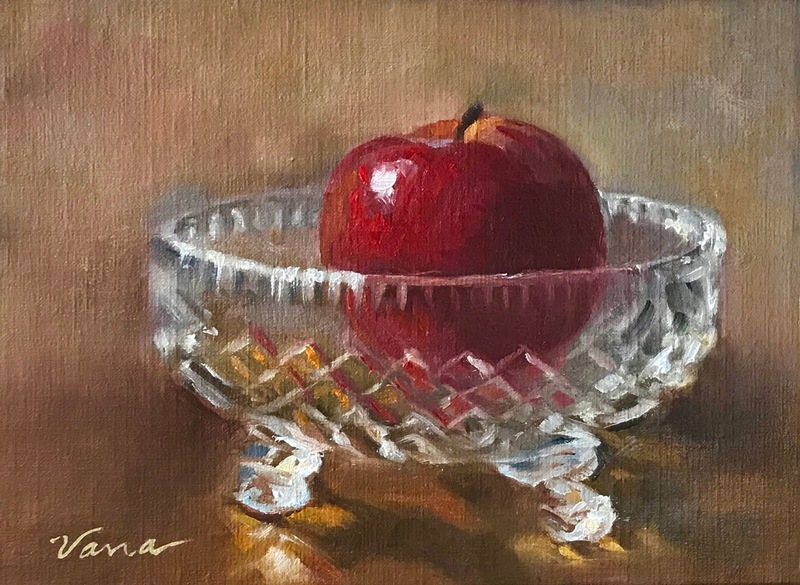 Surface: This is an original, unframed oil painting on a lovely 1/8 inch Belgian linen panel by Raymar Art.